This item is Brand New and comes with a full Onkyo manufacturer warranty. 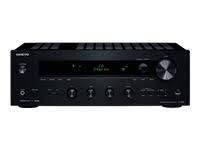 Onkyo's hi-fi revolution gathers pace with the TX-8050. This finely sculpted stereo receiver delivers two channels of audio precision to entertainment spaces where you don't need advanced video processing or multichannel audio. Analog A/V inputs on the TX-8050 are augmented by digital optical and coaxial audio inputs, a universal port for Onkyo peripherals, and a front-side USB input for direct digital connection of iPod/iPhone. The receiver's network capability lets you stream Internet radio or play audio from a PC or network audio storage device. Behind the smart aluminum facade lies a massive transformer and large capacitors that provide clean amplification power and help push performance well beyond the norm.